Every Easter, many dazzlingly eloquent words are written and spoken about Christ’s “Passion” – a singular historical event, graphically portrayed in films like “The Passion of the Christ,” “Jesus of Nazareth” and “The Greatest Story Ever Told.” That these screen depictions serve to powerfully rekindle many believers’ gratitude for what Jesus endured for their sake is undeniable. But I wonder, how often does that appreciation for Christ’s sacrifice ignite a fire in the belly of believers to “take up the cross” themselves? But first things first. What in the world does “taking up your cross” really mean? In ages past, Christians dwelt a lot more on the concept of taking up the “cross” than they do these days. Today, the phrase “it’s my cross to bear” is usually a self-congratulatory reference to the fact that we have to put up with a vexing medical condition, or a child in trouble with the law, or perhaps an overbearing, live-in mother-in-law. Admonitions from the pulpit may not shed much more light. Oh sure, a well-intentioned minister will reverently read one of the scriptures cited above on “taking up the cross,” and he might even briefly plug the ideal of self-denial. But too often this amounts to a polite nod to a notion that seems both archaic and almost irrelevant, or at least unattainable, and the pastor just moves on to more pleasant topics – like how grateful we are for Christ’s death and resurrection. It wasn’t always so. Throughout past centuries, Christian philosophers and mystics dwelt at length on the crucial, life-and-death need for repentance, resignation, “mortification,” the “crucifixion” of sin in man, and the “death of the carnal man” or of “the creaturely self” and so on. Unfortunately, much of what has been written in more contemplative eras about this inner transformation of man is highly poetic and allegorical – an attempt to use mere words to chart the narrow path that connects man’s lowly estate with God’s heavenly one. Although such archaic language may be profound, it’s probably insufficient for Christians today, buffeted as we are on the outside by a voracious and atheistic secular culture, and on the inside by what is increasingly a simplistic and far less rigorous Christianity than that embraced by our forefathers. What exactly is this “creaturely self” that Christian thinkers throughout the centuries have so colorfully warned we must “slay” or “crucify” if we’re to inherit the Kingdom of God? It’s self-evident that we’re all born with a troublesome nature called “pride.” Basically, pride is the part of us that wants to be like God. It loves being praised, quickly puffs up with angry judgment over the real or perceived wrongs of others – and as a rule is oblivious to its own faults. Moreover, you can think of pride as a “life form” – a living, breathing “something” which, like any other life form or “creature,” can be fed or starved. When it’s fed, it grows and enlarges; when it is starved, it diminishes and dies – daily. As our pride – our “sin self” – diminishes and dies through obedience to God, the direct result is that our good side, our true God-centered character and identity, enlarges. We’re not talking about matters of dogma here. Nor is this just a matter of outward behaviors and “works.” So please don’t e-mail me with arguments about “faith vs. works.” This is about real change – about transformation – the mystical heart of the true Christian life, about “dying to the world.” Not an archaic, poetic and hopelessly idealistic notion, but the very heartbeat of our everyday life, as we deal with stresses and problems (“trials and tribulations”) in our lives. Of course – and this is something of a divine paradox – as Christians, we know we can’t save ourselves, and yet we are most definitely called to obedience. So, let’s not slough off our responsibility to “die daily” by comfortably presuming on the unending mercy of God. His mercy is unending, indeed, but also balanced with justice, and these two seemingly contradictory qualities work together mysteriously and wonderfully toward our redemption, but only in the truly sincere human soul that doesn’t tempt God. To understand what “taking up the cross” means, we have to understand why Jesus Himself had to suffer. Although we say “God is love,” we don’t really know what either one is, do we? “God” is beyond our comprehension – like understanding infinity. And “love” – well, we use that word to describe our “strong feelings” for anything and everything we’re attracted to. Let’s talk about real love. There’s one element present in almost every authentic manifestation of real love among us human beings. And that is – are you ready for this? – suffering. From the ultimate expression of love – “Greater love hath no man than this, that he lay down his life for his friend” – to the simple act of being patient with others, love implies forbearance, longsuffering and kindness in the midst of problems. Certainly, Jesus’ words as he was dying on the cross – “Father, forgive them; for they know not what they do” – are the kindest, most patient words ever spoken. Thus, patience is nothing less than the basic “cell” or building block of love for each other. The very idea of being patient implies suffering with grace. The recipient of your patience – say, your spouse or child – experiences that patience as love, just as they experience your impatience as a lack of love. Still, why is love inextricably tied to suffering? Just think: God is the architect of an awesome expanding universe involving heavenly bodies and distances and speeds and temperatures beyond human comprehension, as well as of a never-ending microscopic cosmos of orbiting particles and universes within universes, all too small for human eyes or minds to conceive. And yet, there’s one thing the Creator of all couldn’t just … create out of thin air. And that’s love. Oh sure, He loves us. But I’m talking about our love for Him and for each other – fulfilling Jesus’ two greatest commandments. The only way God could “create” loving children was for us to have a choice: a choice to love Him, or to be our own god – literally, a choice to make something more important than our own lives, well-being and comfort – a choice to love, in other words – and to be able to demonstrate that love, which involves suffering. After all, if I compel you to “love me,” is it real love? Of course not. Love always involves a choice. Jesus’ teaching that there’s no greater love than laying down your life for a friend doesn’t only mean that you have to be willing to die for someone else by jumping into a lake to save them, or taking a bullet meant for them. Remember, Paul said, “I die daily.” It’s a different kind of “death” that’s being called for. You have to be willing to let your pride-self die – for the sake of your “neighbor” – and particularly, for your family’s well being. Small example: If someone puts you down or treats you in a cruel or unjust way and you become angry and upset, you’ve simply failed to find God’s love in that moment and to extend it to the offending person. All of us have fallen for this temptation over and over – I know I have many times. But if we are genuinely patient – that is, if we suffer the cruelty with grace, and resist the temptation to puff up with anger because our pride was offended – we can then respond to the other person with the energy and spirit of God’s love. So do I need to be a martyr? Do an Internet search on the phrase “Take up your cross” and you’ll discover sermon after sermon on the necessity of being willing to be tortured and executed for Christ. Others regard the “take up your cross” reference as a call to the celibate, monastic life. And of course there are lots of references to the conflict between man’s “natural will” and God’s will, and how they are at war with each other. Indeed, “taking up the cross” has always been a common sermon topic. Most typically, listeners are admonished to visit the sick, feed the poor, put their spouse’s desires ahead of their own, tithe and volunteer time for church work, and the like. And while these are all fine actions to take, the problem is, one can do all of them and still remain the same faithless, resentful, doubtful, guilt-ridden, but heavily compensated “nice” person. Worse, the approval and adulation we receive from others for our “good works” often serves to further blind us from seeing and repenting of our well-concealed sinful nature. The point is, we’re not so much in need of a behavior change as we are of a nature change. The “cross” Christ prescribes for us is an instrument of death. But just as He died to bring life, we are supposed to “die” to sin that we may share His life. All of which boils down to this: The real “cross” we have to bear is that we have a fallen nature, which we need to understand and relate to properly — which allows God to change us. Likewise, what if somebody wrongs you so egregiously that you have an impulse to do him bodily harm? You better restrain that impulse too, right? So much for the obvious. How about something more subtle? Let’s say we suffer from envious thoughts. To covet is to break one of the 10 Commandments. So how do we deal with these troublesome feelings? How do we “restrain” them? Certainly not by wallowing in them and indulging them. But also not by repressing them, or attempting to manufacture “good” thoughts and feelings in their place. The Christian answer might be to pray, but what form of prayer? Try this out: If you notice envious thoughts, just observe them – honestly, sincerely, without escaping or trying to change them or making excuses for them or justifying them or getting upset over them. Just see what you see, with poise and dignity – and quietly, wordlessly, cry inwardly to God for help. He will. This is true transparency, which is resignation of your will to His. It calls forth the very process of regeneration, imperceptible though it may be to us. Put another way, “dying” to the world is like fasting – but not from food. The real “fast” God desires is that we fast from evil thoughts, from anger, from envy, from lust, from greed and so on. He wants us to abstain from being irritated by provocations, from becoming impatient and angry toward others, from temptation of all sorts. The truth is, we’re never closer to God than when we’re just plain quiet and still, aware of all of our defects in each precious moment, looking at ourselves first and foremost, without judgment or worry, and having quiet faith that God is there with us and that He will help us. Shortly before His Passion and death, Jesus gave his disciples what He called “a new commandment” – namely, “That ye love one another; as I have loved you, that ye also love one another.” Of course, since He had previously brought forth the Old Testament commandments to love God “with all thine heart, and with all thy soul, and with all thy might” (Deuteronomy 6:5) and to “love thy neighbor as thyself” (Leviticus 19:18), how was this Last Supper commandment then “new”? It was new because He was raising the bar to a higher standard. He was now asking us to love one another as He loved us. We are supposed to live the way Jesus lived, and to suffer the way He suffered. (I said, the way he suffered – with love for each other through obedience to the Father – though obviously not to the extent He suffered.) And, my dear brothers and sisters in Christ, that does not mean only sharing the Gospel of Christ’s atoning death and resurrection with as many people as possible. We are called to a still higher standard – to live as He lived – or maybe to put it more aptly, to love as He loved. In the classic story of “Ben-Hur,” Judah, long-consumed by hatred and a desire for revenge against Masala for falsely condemning him as a galley slave and imprisoning his mother and sister, now lepers, witnesses the crucifixion of Jesus. The real Passion of Christ must connect directly with our own internal programming and strengthen our own spirit, as it did in the story of “Ben-Hur.” We too must die the death God has prescribed for us – the death of pride, the ancient compulsion to be our own god – that we may share the true life He prepared for us, and which His Son purchased so dearly for us. One of the main reasons I’m a Christian is simply because it makes so much sense to me. If God wanted to demonstrate His love for mankind, how else could He do it? Go ahead, tell me! What could He do to demonstrate the depth of His love? Make mountains of pomegranates for everyone? Give everyone a great job and a big house and three luxury cars? Give us everything our proud little hearts desire? No, if God wanted to demonstrate His love for us, and at the same time provide us with the perfect, ultimate example of real love for our fellow man, what could be a more perfect expression of love than the willing suffering and death of His Son – Who while dying asked God to forgive His tormentors? The sheer beauty, logic and power of it is transcendent. If you’re looking for love in this loveless world, that’s it. I know some will be offended by this message, as though by even mentioning and holding up the standard Jesus clearly demanded of His followers, I am somehow denying the sufficiency of His substitutionary death for all mankind. But you see, there’s something really wrong with today’s Christianity. Over 70 percent of Americans consider themselves Christians, but our country’s government, laws, culture and institutions, from its education system to its entertainment industry – are increasingly and overtly hostile to Christianity. Even Christian families all too often are falling apart. Clearly, we’re missing something big. So, while as Christians during the Easter season we reflect on the Messiah’s suffering and sacrifice, the question is: What are we willing to suffer and sacrifice? Can we face our own sinfulness? It’s the one enemy most of us don’t really want to confront. To take up our cross – to “lose our life” for His sake so that we “shall save it” – we need to repent. And we cannot repent without looking in the mirror and honestly facing the sin in our minds and hearts. To stand transparent before God so He can heal us through understanding and repentance may be as hard as watching Jesus being scourged and crucified, but watch it we must. God honors the sincere soul who, with quiet dignity, simply faces the darkness within and repents. This is the heartbeat of our life, without which there is no real life. Each of us has this moment-to-moment choice to make, whether to defend, excuse and enlarge our sinful, hell-bent nature, or whether to pick up our cross, deny our (wrong) self, and follow Jesus – first to death, and then to life. As they led him away, they seized Simon from Cyrene, who was on his way in from the country, and put the cross on him and made him carry it behind Jesus. A large number of people followed him, including women who mourned and wailed for him. Two other men, both criminals, were also led out with him to be executed. When they came to the place called the Skull, there they crucified him, along with the criminals–one on his right, the other on his left. Jesus said, “Father, forgive them, for they do not know what they are doing.” And they divided up his clothes by casting lots. The people stood watching, and the rulers even sneered at him. They said, “He saved others; let him save himself if he is the Christ of God, the Chosen One.” The soldiers also came up and mocked him. They offered him wine vinegar and said, “If you are the king of the Jews, save yourself.” There was a written notice above him, which read: THIS IS THE KING OF THE JEWS. When all the people who had gathered to witness this sight saw what took place, they beat their breasts and went away. But all those who knew him, including the women who had followed him from Galilee, stood at a distance, watching these things. Now there was a man named Joseph, a member of the Council, a good and upright man, who had not consented to their decision and action. He came from the Judean town of Arimathea and he was waiting for the kingdom of God. Going to Pilate, he asked for Jesus’ body. Then he took it down, wrapped it in linen cloth and placed it in a tomb cut in the rock, one in which no one had yet been laid. It was Preparation Day, and the Sabbath was about to begin. The women who had come with Jesus from Galilee followed Joseph and saw the tomb and how his body was laid in it. Then they went home and prepared spices and perfumes. But they rested on the Sabbath in obedience to the commandment. It was normal in Rome for there to be a gap of two days before a prisoner’s judgement and execution, but in Roman colonies, such as Israel, the sentence was often carried out straight away. The Jews especially wanted the death of Jesus to take place as soon as possible, as the next day was the Sabbath (the Jewish holy day) and the final ceremonial meal of the Passover celebrations was to take place after sunset. Jesus would have been dressed back in his own clothes for the procession to the place of execution. The procession would have been made up of four top roman soldiers per prisoner and under the charge of a centurion. It was normally led by the centurion with one of the guards walking in front of each prisoner holding up a white board with the crime of the prisoner written on it. The processions normally took the longest route possible through the streets to show the prisoners off to as many people as possible. But Jesus’ procession went quite a short way to get the place of execution, because the execution needed to take place as quickly as possible. The procession left Pilate’s palace and went through the first gate to a busy shopping area of the city. The shops would have been closed for the Passover celebrations, but there still would have been a large crowd watching with sympathy and pity on the condemned prisoners. Jesus had not eaten, drank, or slept since being arrested the previous evening and had been beaten many times. It was not surprising, therefore, that he was so weak that he collapsed under the weight of his cross piece. However, he did not collapse until he reached the city wall. The Romans would not have wanted him to die before he was executed, so they pulled a man called Simon of Cyrene from the watching crowd to carry the cross. (Simon was probably a Black Jew on pilgrimage to Jerusalem for the Passover celebrations and was camping on the road outside the city. It is thought that he became a follower of Jesus and one of the leaders of the early Church.) Jesus was probably carried the rest of the way by two Roman soldiers. The procession carried on through the outskirts of Jerusalem until it came to a place called Golgatha (which means ‘the skull’ because it is a rocky out-crop that looked like a skull). When the procession reached Golgotha, the soldiers would have first put the uprights of the crosses into the ground. These would have been about two metres (6 feet) high, just high enough that the prisoners feet would not touch the ground. The cross pieces were then laid on the ground and the prisoners were re-tied to them with arms extended, so that the plank went across the shoulder blades, and were tied on at the elbows. Large iron nails were then driven through each wrist nailing the prisoner on the cross piece. The cross-piece was then connected to a rope and pulley and pulled up onto the upright, guided by soldiers using ladders. (In very large Roman places of execution, there were permanent scaffolds set up, so the prisoners could be raised up very easily. But Golgotha was probably not big enough.) The cross-pieces were then nailed and / or tied onto the upright. A small rough wooden seat was put onto the upright to help support some of the prisoners weight. Lastly, the prisoner’s feet were nailed to the upright, either individually or sometimes a huge nail was used that went through both feet, one on top of the other. Once prisoners were in the crucifix position, they could sometimes take days to die. They either died of exhaustion or more commonly they drowned when their lungs filled up with body fluids and blood. People watching crucifixions often offered the dying a drink of strong wine and Myrrh (An embalming agent and anesthetic. It was also one of the three gifts brought to Jesus as a baby by the Magi or Wisemen! ), but Jesus only took a small sip and refused the drink as he did not want his senses dulled. Jesus’ clothes were then divided among the four soldiers that had escorted him to Golgotha. His clothes would have consisted of, a Jewish prayer head covering, a cloak, a linen girdle / undergarment, his sandals and his main robe. The soldiers would have drawn lots for the first four items, but who would have the main robe, that would have been made of good quality cloth and so was worth quite a lot of money, was decided by gambling with dice. This made an Old Testament prophesy come true, where it says in the book of Psalms 22:18 that: They divide my garments among them and cast lots for my clothing. Jesus’ prayer “Father forgive them” although primarily directed at the soldiers, also involved the Jewish leaders for killing the Son of God. The soldiers continued to make fun of Jesus and offered him some cheap wine they were drinking while the gambled at the bottom of the cross upright. Then one of the other criminals hanging next to Jesus mocked him, sarcastically asking Jesus for help. But the other criminal realized who Jesus was. He knew that he was innocent of any crimes and told the other criminal to keep quiet and said that they really deserved to be there, but that Jesus didn’t. By asking Jesus to remember him when he entered into paradise (or heaven), the criminal would have meant ‘judgment day’ or the end of the world that was talked about in the Jewish scriptures. He would have been very shocked (and so would have all the onlookers) when Jesus said, “Today you will be with me in paradise”. The Jewish onlookers would have understood this to mean that Jesus was claiming the power to judge people and decide who would enter Heaven. There is a very powerful and moving song telling this part of the Easter story called ‘Thief’ by my favourite Christian rock group called Third Day. It is written from the perspective of the thief who knew who Jesus was. It was noon when the sky went dark. It was called the Sixth hour because the hours of the Jewish day were measured from sunrise, about 6.00am. By this time, Jesus had been hanging on the cross about two and one half to three hours. Also by this time, John had gone and brought Jesus’ mother Mary and few other women followers of Jesus to the Cross. These were the only disciples of Jesus to be there when was executed. John was the only disciple who had been with Jesus all the time since he had been arrested. The sky stayed black from noon until 3.00pm. 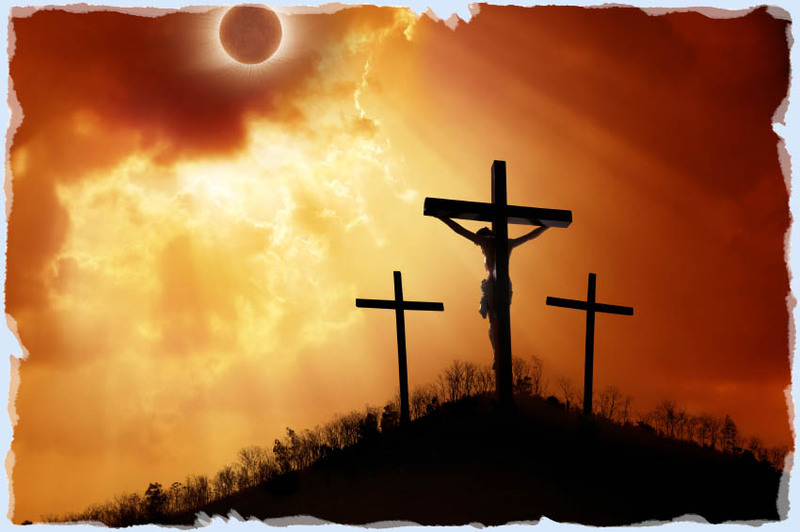 The darkness would have not only been in the sky, but also in Jesus’ heart as he experienced all the the sin, pain and death, past, present and future that ever existed on earth. At about this time Jesus died. He cried out “My God, my God, why have you forsaken me?” (Mark 15:34). This is the first line of Psalm 22 (The Psalms were/are Jewish and Christian songs & poems.). In those times, if you wanted to start a Psalm you didn’t used a number, but the first line. By saying this Jesus was bring the onlookers attention to the whole Psalm, which accurately describes His crucifixion and death, although it was written hundreds of years before! But the Psalm doesn’t stop with the death, at the end of it, it talks about God (Jesus) coming to rule over the earth and people praising him! After this Jesus spoke his words: “It is finished” meaning his work on earth, and “Father, into your hands I commit my spirit.”. This is a quote from Psalm 31 verse 5, meaning that Jesus gave up his will and life fully to God, trusting in him, even into death. The words were yelled as in triumph at the end of a battle, not whispered in defeat. This had a profound effect of the Roman centurion in charge of the crucifixions as he recognised who Jesus was. As Jesus died, a violent earthquake shook Jerusalem. It tore in two a large curtain that hung in the Temple. The curtain was about one metre thick and made of the heaviest and most expensive cloth. It separated the main part of the inner Temple from the ‘Holy of Holys’, the room at the very centre of the Temple that only one Priest was allowed to go into once a year. It tore from the top to bottom. The curtain represented the separation of God from man, so the curtain being destroyed would have been a very shocking symbol to the Jews and a sign that something powerful had happened – Jesus had opened God to everyone! Jewish law stated that a dead body could not be on display after sunset, especially not the Sabbath. This would have started at Sunset and remember, it would have been the Passover Sabbath, the most important Sabbath of the year. So the bodies would have be to removed quickly. People being crucified could sometimes take days to die. So to speed up the death, the arms and legs of the prisoners were broken and then they were stabbed through the heart. This would have happened to the other two men being crucified with Jesus, but when the soldiers got to Jesus they found him already dead. This fulfilled another prophesy which said the Messiah would be like the Passover lamb, i.e. perfect with no broken bones. All that happened to the body of Jesus was that his side was pierced to drain out the body fluids and make the dead body easier to handle. For a crucifixion, Jesus had died very quickly. But he had been beaten several times before he was crucified and was so a lot weaker than a normal crucifixion victim. More importantly, as the Son of God, he is the only person who ever lived who could ‘dismiss his own spirit/soul’ and so die by a word of his command! Then Joseph of Arimathea who was a Jewish council member and a secret friend of Jesus came to ask the Romans for the body of Jesus. He had not been called to the ‘trials’ of Jesus, because Annas and Caiaphas thought he might stop the trials and call them unlawful. Joseph was a rich land owner and had a tomb ready for a burial nearby. It was probably where he was going to be buried, but he was willing to give it up for Jesus. The Tomb would have been a large cave with two body shaped niches carved into the side walls. Joseph and another council member called Nicodemus (who had also got to know Jesus quite well) took the body of Jesus to the tomb and quickly embalmed the body. Mary and the other women would have also gone to the tomb, but would have only watched this initial embalming. They planned to come back on the Sunday morning, just after sunrise, to embalm the body properly. This would have been the earliest time under Jewish law that they would have been allowed to return to the tomb after the Passover Sabbath. The body would have then been laid in the niche and a very large stone was rolled in front of the tomb entrance. At the request of the Jewish leaders, the Romans put a guard of the best and most highly trained soldiers on the tomb to make sure no one could steal the body. The disciples then left to mourn and await the sunrise on Sunday, when they could go back to the tomb and embalm the body properly. Texas Backs Chick-fil-A, Come What Mayo! Chick-fil-A may cater, but not to the demands San Antonio liberals care about. Now, three weeks into the city council’s decision to ban the restaurant from the local airport, Texas conservatives know: this case for their religious liberty bill was made to order. “Everyone has a place here, and everyone should feel welcome when they walk through our airport,” City Councilman Roberto Treviño told the media after the council’s 6-4 vote to boot the chicken chain from opening a shop in the terminal. Why? Because the owners dare to donate to charities like the Salvation Army. “Ridiculous!” Texas Senator Ted Cruz (R) responded on Twitter. “That’s not Texas,” he argued. Unfortunately, the state’s conservatives worry, that will be Texas if something isn’t done to protect religious freedom. “With this decision,” Treviño insisted, the council “reaffirmed the work [San Antonio] has done to become a champion of inclusion.” Until, of course, that “inclusion” applies to people who support natural marriage and sexuality. Where’s the equality for them? That’s a question the Lone Star State is trying to answer with the introduction of SB 17, the Free to Believe Act and the First Amendment Defense Act. Chick-fil-A may be a private company, but that doesn’t mean it has to surrender its beliefs at the dining room door. And the same goes for any American trying to live out their faith in the public square. The San Antonio City Council thinks it can’t, “in good conscience,” sign an airport agreement with a business owned by Christians. But isn’t that exactly what this debate is about — conscience? Just because the Cathy family owns a national restaurant chain doesn’t mean they’re excluded from the First Amendment. Regardless of what liberals say, religious freedom isn’t just for churches. It’s for every business, wedding vendor, adoption agency, charity, doctor — every citizen. And that’s what SB 17 is hoping to remind Texans. “We’re waking up in an era where Christian faith, specifically, seems to be under attack,” said state Sen. Charles Perry (R). In the current political climate, he’s worried Christians can’t practice their faith openly without facing consequences — including the loss of their jobs and livelihood. Under the Free to Believe Act, government officials can’t punish Texans for thinking differently than the radical Left. That’s just “a license to discriminate,” LGBT activists argue. Not true, Republicans like Lt. Governor Dan Patrick (Texas) fired back. No one is trying to create a religious excuse for businesses to turn people away. No believer I know would want that — let alone lobby for it. As even Chick-fil-A has said, everyone should feel welcome at its restaurant. This debate has never been about Christians discriminating against anyone — it’s about stopping the government from discriminating against them! In Chick-fil-A’s case, the Left’s overreaction is almost comical. The Cathy family hasn’t done any overt lobbying on natural marriage for years. In fact, they’ve intentionally backed away from taking a stand on issues of biblical morality — yet still, they’re a target. That ought to show everyone that there’s just no appeasing the Left. Simply being a Christian in the workforce — even a polite and politically silent one — is enough to draw the liberals’ wrath. But the Democrats’ new terrain, where your personal views disqualify you from participating in society, is a dangerous precedent. If liberals choose not to eat Chick-fil-A, that’s their right. Just like it’s our right not to shop at Target until they stop putting women and children in danger with their bathroom policies. What isn’t our decision — or theirs — is to exclude these businesses from the market altogether. If you agree, join our friends from Texas Values in Wednesday’s Save Chick-fil-A Day! Come to the state capitol for the House hearing on the Free to Believe Act, and then drive-through your local chain on the way home. Help Texas leaders show the country that there’s always an appetite for real religious freedom! As seen here at Family Research Council. Posted here with permission. Author Narrow Path MinistriesPosted on April 19, 2019 Tags Bible, Chick-fil-A, Christian, Christian Thinking, Christians, Church, Cross, Jesus, Jesus Christ, Morality, New Testament, Obedience, Persecution, Planned Parenthood., Pro-Life, Salvation, TexasLeave a comment on Texas Backs Chick-fil-A, Come What Mayo! Is the Resurrection a Product of Legendary Embellishment? Do the gospels contain legendary embellishments when it comes to Jesus’ resurrection? Did the original disciples really believe that Jesus died, was buried, and then rose from the dead? Leaving aside the fact that a compelling case for the resurrection can be made from the gospels themselves , let’s address this objection that the gospels contain these legendary embellishments. The reason this passage is so important is that there is good reason to believe that this teaching is not original with Paul but rather, goes back to the original disciples of Jesus, dated to within five years of Jesus’ death. 1. Paul uses two terms to indicate that he is carefully passing on a tradition that he received from someone else: παρέδωκα (“delivered”) and παρέλαβον (“received”). Since we know that Paul’s past as a Pharisee instilled in him high regard for traditionand that he maintained his high view of tradition, we have good reason to believe that Paul is accurately passing on a tradition that is not his own. 3. There is obvious structure and parallelism. The passage is broken into four lines, each introduced with the term ὅτι (“that”). The first and third lines are longer and follow the pattern of verb, clarification, and an appeal to the Scriptures. These longer lines are both followed by the shorter second and third lines. 1. Paul himself believed that doctrine originated in Jerusalem. Paul says in 1 Corinthians 15:11 that “we” preach the tradition above. In the context, he is referring to the apostles along with himself. However, the original church leaders were headquartered in Jerusalem. So, we have good reason to believe that this tradition came from Jerusalem. 2. There are at least two occasions where Paul visits Jerusalem before the writing of 1 Corinthians. The first is three years after his conversion, for a total of about five years after the death of Jesus, when he stayed fifteen days to “visit” or “become acquainted” with Peter. It is hard to imagine Paul, someone with incredible drive and zeal, spending over two weeks with a man like Peter, and the two of them never discussing the bedrock of their new-found fellowship in Christ. 3. Also, on this first occasion, Paul uses the word ἱστορῆσαι (“visit” or “become acquainted with”) from which derives the English word “history.” The word’s definition is to visit “for the purpose of coming to know someone or something…to get information from.” Therefore, the word that Paul uses indicates that this was not a casual visit and that an exchanging of information characterized his time with Peter. There are other occasions on which Paul would have had the opportunity to receive this tradition, but it is hard to see why he would not have received it on this first visit. In light of this evidence, it is difficult to see how the resurrection account in the gospels is legendary. For, not even five years after the events, the central component of the original apostle’s preaching was the death and resurrection of Jesus. 1 Corinthians 11:2;23; Philippians 4:9; 1 Thessalonians 2:13; et al. 1 Corinthians 15:9; Galatians 1:19 et al. Licona, The Resurrection, 226-227, 30. Galatians 1:17-28; 2:1-10; Acts 1:8; 8:1; 15:2 et al. Arndt, William, Frederick W. Danker, Walter Bauer, and F. Wilbur Gingrich. A Greek-English Lexicon of the New Testament and Other Early Literature, (Chicago: University of Chicago Press, 2000), 483. There is literally a gospel in which Jesus’ head is stretched into the sky. That’s a clear case of the resurrection accounts being the product of embellishment. It was even written about on another post on this blog as a reason to reject that gospel. What are your rules for rejecting an embellishment? What exactly is “too crazy” to consider? This is an excellent question. Historians have developed several different criteria in order to assess the likelihood of an account being genuine. These include attestation that is multiple, early, and independent. Historians also prefer testimony that is dissimilar (not what you would expect given the author’s beliefs and tendencies), embarrassing (something that would reflect poorly on the message of the author), coming from eyewitnesses. There are others, but these are some of the most important. In making a determination In other words, if an account is early, multiply attested by independent eyewitnesses on the basis of dissimilar testimony, you’ve pretty much hit the jack-pot of historical inquiry. The pre-Pauline creed 1 Corinthians 15:3-5 gives us just that. It goes back to multiple, independent eyewitnesses within about 5 years of the event, preaching as their central doctrine a message that they and Paul had every reason to reject. Therefore, the resurrection account is just too early, too central, and too widespread to be accounted for on the basis of legendary embellishment. Others are certainly at liberty to try and account for it by other non-supernatural means, but legend, in this case, is almost less believable than a miracle. As you say, heads stretching into the sky, and I would add crosses walking and talking, are clearly legendary embellishments. But why would a second-century document with no clear ties to eyewitness testimony call into question an event so well attested elsewhere? What is really interesting is that if one looks at the Early Creed in First Corinthians 15, no one in the list of eyewitnesses ever claims to have seen a resurrected BODY! Without the Gospels, which most scholars believe were not written by eyewitnesses or associates of eyewitnesses, it is entirely possible that the original appearance claims were all based on people seeing a bright light…and believing it to be Jesus. Gary, no offense, but how dumb do you think these 1st century Christians were that they could have mistaken a bright light for Jesus? The language of the passage clearly indidcates a physical resurrection in that 1) he was “raised” from the grave, and 2) he appeared to Cephas, THEN to the Twelve. It’s describing a sequence of sightings, which means in order for your theory to be correct, this “light” would have to have appeared to them individually, and they all would’ve somehow had to mistake it for a person! This assertion is just false. There is a clear connection between Mark and Peter, who claimed to be an an eye-witness (Acts 4:20) and there are many scholars who argue this connection. There is much information out there on the topic of Mark being Peter’s scribe, you need not search hard. Gary, you are quite right in saying that it is “possible” to attribute the testimony of Jesus’ resurrection to simply seeing a “bright light.” It is also “possible” that the whole universe came into existence five minutes ago, meaning you have memories of events that never actually happened and food in your stomach that you never actually ate. What is lacking in both cases is any good reason for thinking that these possibilities are actually true. Further, I think there are good reasons for thinking that the “bright light” hypothesis fails. Allow me to briefly sketch only two: First, whether this light is it subjective or objective, it is problematic. If subjective, then it cannot account for the group appearances. If objective, then you are postulating at least five events ad hoc, and are being selective in a sixth event. Second, there was no expectation of a dying Messiah at this time, let alone a Messiah dying a criminal’s death and then coming back to life. It is tenuous indeed to suppose that simply seeing a bright light would have been sufficient to overturn this expectation, especially in those who did not already believe that Jesus was the Messiah (i.e. Paul and James). Author Narrow Path MinistriesPosted on April 19, 2019 Tags Bible, Christian, Christian Thinking, Christians, Cross, Jesus, Jesus Christ, Morality, New Testament, Obedience, Persecution, Pro-Life, Resurrection, SalvationLeave a comment on Is the Resurrection a Product of Legendary Embellishment? If you take a course in the sociology of religion at any college or university, the professor will inevitably spend some time on what is known as secularization theory. This theory posits that as societies become more economically prosperous and obtain higher levels of education, the inevitable result is a movement away from organized religion and toward secularization. The famous psychiatrist Sigmund Freud was fond of comparing religion to a child’s fairy tale and believed that as society becomes more focused on reason, it will drift away from religious faith. Karl Marx contended that religion was used as a tool to keep the masses from understanding how exploited they were by the ruling class. Marx famously wrote that religion was “the opium of the people.” The logical conclusion of secularization theory is that economic and educational progress is a fact of modern civilization and therefore the inevitable outcome is a casting off of religious beliefs. The graph that is often offered to bolster this claim looks strikingly similar to the one below. The horizontal axis provides a good proxy for economic prosperity (gross national product per capita), while the vertical axis represents the overall level of religiosity in a nation. The conclusion from this graph is clear: the more economic prosperity a nation enjoys, the fewer citizens of that country say that religion is very important. There are a few outliers, however. China is in the bottom left portion of the graph, which means that based on the country’s economic output it should be more religious than it currently is, with the same occurring in Hungary. Obviously, both of those countries have a history that is closely associated with communism, which is the likely cause of their low levels of religiosity. On the other hand, the United States is clearly an outlier on this graph. It ranks as the most economically prosperous country in the dataset, but if it were going to be in the middle of the trend line, the overall level of religiosity should be very close to zero. Instead, just over half of Americans think that religion is very important. The United States clearly bucks the trend of secularization when looked at from this angle. There are two possible thoughts that emerge from this. One is that secularization is coming to the United States, it’s just moving a little slower. The other is that somehow the U.S. is different and is the exception to secularization. Recent data on America’s religious behaviors can help us understand what is really occurring. Turning to surveys of Americans can be helpful in understanding the relationship between education and religiosity. The bar graph below displays the percentage of each educational group that identifies as a religious “none” (atheist, agnostic, or nothing in particular). Educational attainment serves as a very good proxy for economic prosperity and provides a solid test of secularization theory. Note that each of the six waves of the Cooperative Congressional Election Study contain between 30,000 and 65,000 respondents. The results are unambiguous: those with the least amount of education are consistently the most likely to identify as religiously unaffiliated. The far right bar in the graph, indicating those with a graduate level education are almost always the group that is the most likely to be religiously affiliated. If one would like to argue that education is related to secularization, there is no evidence to support that conclusion to be found here. However, there is a more specific way to approach this problem. The above graph lumps the entire sample into six education categories with little regard for whether they obtained their high school diploma in 1968 to 2008. If secularization was a constantly accelerating process, we would expect to see younger people with graduate degrees unaffiliate at higher rates than their older counterparts with high levels of education. In order to test this, I broke the CCES 2018 sample into birth cohorts, which are created based on five year intervals. For instance, I placed everyone born between 1940 and 1944 into the same cohort. I then calculated the share of each educational level who had no religious affiliation for all fourteen birth cohorts in the sample. For this visualization, an upward sloping line would provide support for secularization, while a downward sloping line would indicate that secularization is not occurring. For the top row of cohorts, ranging from 1930 to 1949, there is some evidence of secularization, as those with more education are more likely to be unaffiliated. The second row, however, tells a different story: the lines are flat. This indicates there is no relationship between education and religious disaffiliation for those born between 1950 and 1969. The last six cohorts (those born between 1970 and 2000), show lines that consistently sloping downwards. The results of this graph indicate that, for those between the ages of 18 and 49, the more education one obtains the more likely they are to affiliate with a religious tradition. Taken together, the results from this sample tell a simple story: secularization is apparent for older generations of Americans, but for those born after 1950 there is no evidence that education leads to a decline in religious affiliation. So, why is this happening? The sociologist Philip Schwadel provides some insight in a paper he published in 2014. First, Schwadel notes that obtaining a higher education has become ubiquitous in modern American society. While only certain types of people would go on to college in previous years, a college education is an obtainable reality for people from all types of socio-economic, racial, and religious backgrounds. That may mute the self-selection effect that was occurring in prior generations. In addition, Schwadel argues that the well-educated are often early adopters of cultural change, which meant a move toward religious disaffiliation in the 1970s and 80s. Subsequently, those behaviors then trickle down to the rest of the population who began to disaffiliate from religion as well. Therefore, what may be occurring in the younger cohorts is the pendulum swinging in the opposite direction, with the highly educated portion of the population returning to religion. To use an oft-repeated phrase, “The kids are alright.” The perception that younger Americans are becoming more educated and therefore less religious finds no empirical support in this data. In fact, a bigger worry may be young adults who don’t pursue education beyond high school, as many of them are espousing the lowest levels of church attendance of any birth cohort. If one thinks that the path of the United States looks like Sweden, where 60% of adults have no religious affiliation, that seems unlikely. In addition, this should alleviate some of the concerns that parents have when they send their Christian teenagers off to a secular college or university. The evidence is clear: among their generation, more education leads to higher levels of church attendance and a lower likelihood of becoming religiously disaffiliated. There is hope for religion in America, yet. Author Narrow Path MinistriesPosted on April 18, 2019 Tags Christian, Christians, Cross, God's Mercy, Jesus, Jesus Christ, Morality, New Testament, Obedience, opium of the people, Persecution, Salvation, secularization, secularization of AmericanLeave a comment on Is Religious Decline Inevitable in the United States? Actually, I am Jewish and I do believe in Jesus. You can call me a Messianic Jew. You can call me a Jewish Christian. I am, most certainly, both. “There is neither Jew nor Greek, there is neither bond nor free, there is neither male nor female: for ye are all one in Christ Jesus” (KJV). Using this same logic, a man who believes in Jesus is no longer a man and a woman who believes in Jesus is no longer a woman. Or a slave who believes in Jesus is no longer a slave and a free person who believes in Jesus is no longer a free person. It would also mean, going back to the days of Paul, that the moment a slave became a Christian, he could inform his master that he was no longer a slave and would be leaving post haste. This wrong reading of Galatians 3:28 would also bring into question why Paul actually gave specific directives to men and to women, to husbands and to wives, to slaves and to masters. Why do this if these distinctions no longer existed? Of course, there are still Jews and Gentiles, men and women, slaves and free. Paul’s point was that, in Jesus, there is no caste system and no class system, no one higher and no lower. Every believer is equally a child of God, equally forgiven and loved by the Father, equally a member of Christ’s body, equally a priest to God, equally a branch of the Vine. That’s the incredible, liberating power of the gospel, and Paul’s words were truly revolutionary when written. They are revolutionary to this day. Yet Paul could refer to his own lineage (he was still an Israelite, of the tribe of Benjamin, a Hebrew of the Hebrews; see 2 Corinthians 11:22; Philippians 3:5, although, to be sure, he put no confidence in the flesh). And it was James (Jacob) who shared with Paul that there were tens of thousands of fellow-Jews who now followed Jesus as Messiah (Acts 21:20). He did not call them former Jews. That, of course, is true, and I never deny that in the least. I am not a traditional Jew and I do not practice traditional Judaism (although I do appreciate many of our traditions). But there are millions of nominal Jews (including a healthy percentage of atheistic Jews), yet very few question whether they’re still Jewish. There are even Jewish Buddhist (called Jubus) and Jewish cult members, and they are still recognized as Jews. Why, then, are they still Jewish, yet I am not Jewish – despite my deep connection to my people. Despite being married to a Jewish woman (who also believes in Jesus). Despite learning Hebrew after coming to faith. Despite believing in Jesus (Yeshua) as the Jewish Messiah. Despite honoring every word of the Tanakh (what Christians call the Old Testament). To be sure, most rabbis I have interacted with over the decades recognize me as a Jew but believe I have gone astray. That, however, would mean that nominal Jews and atheistic Jews were no longer Jewish because they were not following traditional Judaism. More importantly, that would deny the fact that being Jewish is both religious (practicing Judaism) and ethnic (born of a Jewish parent or parents). Even more importantly, those who claim I’m no longer Jewish must forget that Jesus was born King of the Jews and died King of the Jews. That all of His first followers were Jews. That most (if not all) of the New Testament books were written by Jews. And that the gates of the New Jerusalem will carry the names of the Twelve Tribes of Israel while its foundations will carry the name of the Twelve (Jewish!) Apostles. You better believe that you can be Jewish and follow Jesus. In fact, the majority of us who identify as Messianic Jews will tell you that following Jesus has made us even more Jewish. The truth is that I am saved by grace, forgiven through the cross, redeemed by the love of God – and still Jewish. And there are hundreds of thousands of others just like me. Author Narrow Path MinistriesPosted on April 17, 2019 Tags Christian, Jesus, Jews2 Comments on Are Jews Who Believe in Jesus Still Jews? Chu Yiu-ming, center, appears with Benny Tai and Chan Kin-man before entering court to hear their verdict. ABaptist pastor in Hong Kong turned the stands of a Hong Kong courtroom into his pulpit, quoting Scripture and calling for justice in the name of God, after he and eight other activists were convicted Tuesday for crimes related to their involvement with pro-democracy Occupy Central and Umbrella Movement protests. Chu Yiu-ming, leader of Chai Wan Baptist Church, recounted his testimony of finding hope in Christ after a bleak childhood and defended his calling as a minister to fight for human rights, dignity, and care for all people. An English translation of Chu’s remarks to the court was printed in full in the Hong Kong Free Press. As a special administrative region of China, Hong Kong has been afforded more freedom and autonomy in than the mainland. But it does not elect government leaders directly, and Christian leaders and activists are increasingly worried about encroaching Communist control. We strive for democracy, because democracy strives for freedom, equality, and universal love. Political freedom is more than loyalty to the state. It professes human dignity. Every single person living in a community possesses unique potentials and powers, capable of making a contribution to society. Human right is a God-given gift, never to be arbitrarily taken away by any political regime. Meanwhile, 200 Christians had gathered for a worship service at Kowloon Union Church, where the Chu and the others first announced the Occupy Central campaign, to pray for a favorable verdict for the leaders, Evangelical Focus wrote. Outside the courthouse, supporters held umbrellas as a sign of the protests. Protestant Christians make up about 6 percent of the population in Hong Kong. Wary of Communist oversight, they have played a major role in the push for democracy over the past several years, spurred by their biblical convictions regarding social justice and their willingness to suffer for the cause, one leader told NPR amid the Umbrella Movement protests, which shut down streets in the city back in 2014. Chu has served as a pastor in Hong Kong since 1974 and told the court about worrying that his ministry over the years—advocating on behalf of the poor and suffering—could get the church in trouble with the government. He said he found strength in Scripture, which he quoted more than a half-dozen times during his remarks before the court. Chu faces up to seven years in prison and awaits a sentencing hearing later this month; others with additional convictions could get even lengthier sentences. According to news reports, the fellow Occupy Central cofounders asked that he be spared a prison sentence. NarrowPathMinistries Create a free website or blog at WordPress.com.